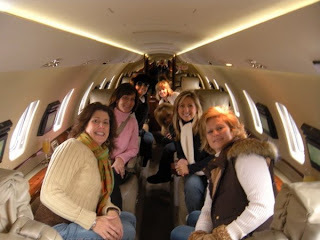 Just got back from another fabulous girl’s trip in the mountains. This time of year, Lake Toxaway is pretty deserted…most of the homeowners are away, the club and golf course are closed, the boats are stored away, but it is still beautiful and relaxing and breathtaking. 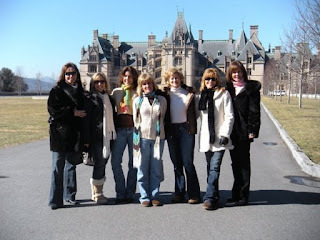 Seven of us met at the airport for an 8:30 flight to Asheville, then drove over to the Biltmore for the day. Even at this advanced age we are easily amused. Friday we drove up to Lake Toxaway and spent the rest of the weekend at the house. It was so great just to be together with the girls. We’re all so busy with work, kids, and life stuff, that when we can really get away like this it’s just such a fantastic, inspiring, relaxing time. We built a fire, made vegetable soup and chili, went for a long hike to the Toxaway River falls, and spent the evening drinking wine, telling stories, playing games, and dancing. Around 1 a.m., the smoke detectors started going off throughout the entire house! We all jumped up and started running around, trying to figure out what was going on. 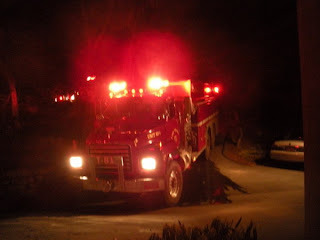 It was probably pretty comical, seven girls running around like crazy, trying to fan the smoke alarm, turning off the house alarm, until we figured out that someone had set a fire in the downstairs fireplace without opening the flue. She thought it was open, I’m sure, but when we figured out what was happening, we couldn’t find the damper. My friend, T, who is a little neurotic (but I love her), kept insisting I call the fire department, but since they’re all volunteers and it was late I kept saying we didn’t need them. This fireplace had never been used, and I think the wood had been in there for a couple of years, so it was old and dry and it was smoking like I’ve never seen anything smoke! The fire was so hot it was almost leaping out of the fireplace, so I started to panic, and called 911. Well, those boys must not get called very often. They came roaring up with two huge fire trucks, along with what must have been the chief’s pick up truck. The second before they got there, we had finally gotten the damper open, and the alarms had just stopped, so we felt pretty stupid. The head guy told one of the trucks to go back, and came inside to check things out. He was explaining some things to me and his eyes were watering like crazy. I asked if it was from the smoke and he said, “No, I just woke up.” We felt terrible for dragging them out of bed, but honestly, they were all grinning, like they were enjoying themselves. They’d probably never had a call from 7 (slightly inebriated) women in their pajamas…I can imagine they’ll at least have something to talk about now. Other than that, it was a perfect weekend with girlfriends. It just doesn’t get any better.